Nell Zink will read at the Free Library Tuesday, Oct. 4. The plot, in part, concerns the crusty, occasionally lusty, dumpster-diving residents of a squat in North Jersey who are united, above all else, in their sheepish defense of smokers’ rights. Their other concerns are a little bit activisty (they go to protests but mostly stay confined to the smoking sections situated blocks from the action) and a little bit slacktivisty (they mainly show support for pet causes by clicking "like"). New on the scene is Penny, who feels just as wayward as the rest of them, but she comes from money and a fairly effed-up family, the details of which I won’t spoil for you here. Suffice it to say, the death of its patriarch, Norm, sends the family scrambling in different directions. Poor lost Penny, the youngest, seems to be the only one in mourning. 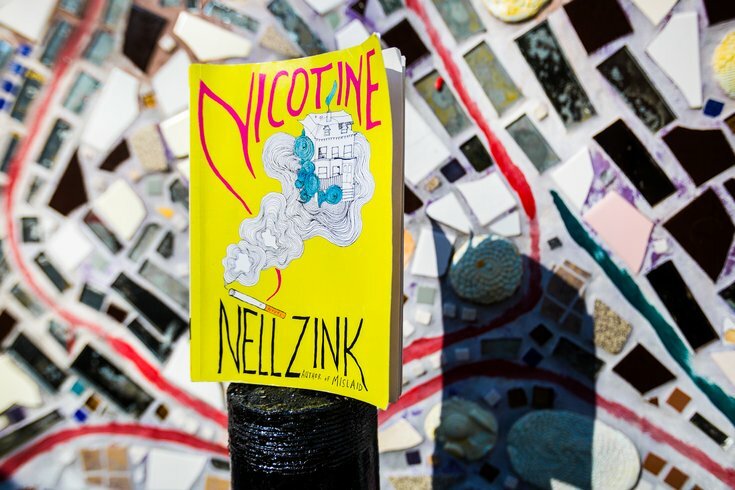 “Nicotine” is a good yarn, plot-wise, but the real hooks are in its sometimes subtle (though occasionally broad) bits of satire. It’s not mean-spirited — these post-post-hippies mean well, after all — but the book has teeth and bares them in fun ways. Every single one of Zink’s novels has been different, and a bunch came with a Jonathan Franzen seal of approval. This might not be her most “important,” but it’s gotta be the most fun.